This article shows you how to build a fully functional Geiger Counter capable of measuring the three primary forms of radiation*; alpha, beta and gamma radiation. The geiger counter is sensitive enough to detect background radiation. It's expandable. You can enhance the basic Geiger Counter by adding a Digital Meter Adapter (DMAD) that adds a digital output for the Counts Per Second (CPS). The DMAD when used with a USB TTL adaptor can use our free Windows Radiation monitoring program . The DMAD also has a true Random Number Generator function. The windows XP radiation program is free and available for downloading here. The Geiger Counter produces an audible click and blinks a LED each time it detects a radioactive particle. It has a Data output jack, that outputs a +5V pulse everythime a radioactive particle is detected. It also has a headphone jack for private listening. Typically the Geiger counter clicks 10-20 times a minute due to normal background radiation. While the device is sensitive enough to measure background radiation, it is not suitable for measuring radon gas. There are Radon gas detectors that use an activated charcoal filter that are easy to use and more accurate. Radioactivity is the spontaneous emission of energy from the nucleus of certain atoms. The most familiar radioactive material is uranium. There are three forms of energy associated with radioactivity; alpha, beta and gamma radiation. The classifications were originally determined according to the penetrating power of the radiation, see Figure 1. Our Geiger Counter can detect the three types of radiation; alpha, beta and gamma radiation. Alpha radiation are the nuclei of helium atoms, two protons and two neutrons bound together. Alpha rays have a net positive charge. Alpha particles have weak penetrating ability, a couple of inches of air or a few sheets of paper can effectively block them. Beta radiation were found to be electrons, identical to the electrons found in atoms. Beta rays have a net negative charge. 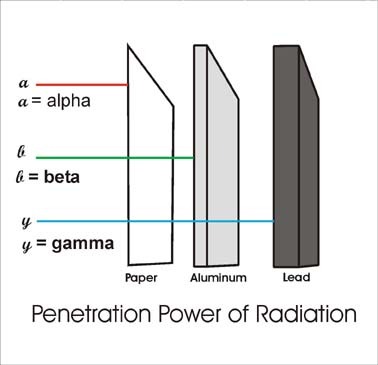 Beta rays have a greater penetrating power than Alpha rays and can penetrate 3mm of aluminum. Gamma radiation are high-energy photons. This has the greatest penetrating power being able to pass through several centimeters of lead and still be detected on the other side. Thick lead is needed to attenuate gamma radiation.